James Hewitt's large and comprehensive book on yoga constitutes a virtual encyclopedia of yoga practice and practical yoga, as well as of the philosophy and background of yoga. It is divided into three separate book-length sections. The first part is concerned with raising the levels of health and energy through the control of breathing. It also considers psychophysical poise and the contributions of yoga to hygiene and diet. Breath control (prana-yama), which is often neglected in the literature of yoga for Westerners, is given, in this section, the prominence it has long deserved. In this part, too, Hewitt relates various postures and muscle control to sexual health and fitness. The second section of the book is one of the most complete guides ever to be published of the asanas, or postures, of yoga. Hewitt describes over 400 postures. He includes warm-ups and offers many modifications of basic postures for people who are just beginning yoga or who have special problems. He gives the rules for practicing the postures, and guidance for a complete plan or program for beginners, as well as intermediate and advanced students. Accompanying his detailed descriptions of the postures and their various users are clear and easy-to-follow instructional drawings. 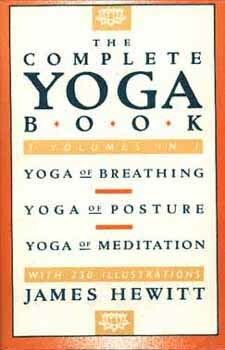 The third section begins with a survey of the history and philosophy of yoga. Starting with Patanjali's classic Raja yoga, the author leads the reader into a description of the techniques of concentration and meditation. He presents a full survey of various meditative methods including that of transcendental meditation, and discusses the possession of psychic powers and the potentialities of biofeedback, relating all these developments to classic techniques of meditation and yoga. All in all, James Hewitt, the author of more than twenty books, including several on yoga and related subjects, has written a practical guide to yoga of great breadth and comprehensiveness.